A few months ago you probably heard the story about Burger King giving out coupons for $0.01 burgers every time someone entered a McDonald's with the Burger King mobile application installed. Whether or not you like either fast food chain, this was a ingenious marketing strategy and use of location in a mobile application. So how does something like this work, from a technical point of view? Since I don’t work for Burger King, I can’t give you the definitive story behind their technical adventures, but I can make some assumptions. Long story short, the fast food chain created a virtual geofence around each of their competitors stores. Using positioning within their mobile application, they likely determined whether or not that device entered a geofence and if it did, send them a notification with a coupon. Yes, the example does not look polished, but that would be designers' job anyway. However, the functionality is there. The goal is to create two geofences. Where I live there is a Domino’s Pizza directly next to a Pizza Hut. Why two pizza restaurants are directly next to each other is beyond me, but it leaves an opportunity for this example. If we enter the geofence for Domino’s, we’ll get a message to go eat at Pizza Hut and if we enter the geofence for Pizza Hut we’ll get a message to go eat at Domino’s. It’s simple, but can be expanded to be more powerful. To save the client from having to do a lot of number crunching, geofence position detection is handled server side from the HERE servers. Essentially we upload fence data and then we send our position every time we want to check the proximity to a fence. Remember, we could have potentially thousands of fences, so doing this client side would not be a good idea. It is very important that the file is tab delimited and those are actual tabs, not spaces representing tabs. The NAME column represents the name of the particular fence. For example it could be a store id value or whatever else you can think up. The WKT column represents the actual geofence. Give the file a name with a .wkt extension and add it to a ZIP archive. The file must exist at the root of the ZIP archive. Take note of the layer_id and make sure you provide your own app id and app code values, found in the HERE Developer Portal. You can have numerous layers, representing different groups of geofencing data, so it is important to reference the correct layer_id in the Android project. While neither a map or visual polygon objects are truly necessary for this example, it gives us something a little more interesting to talk about. Remember, positioning and geofencing doesn’t require a visual component at all as most of our logic is through HTTP requests. 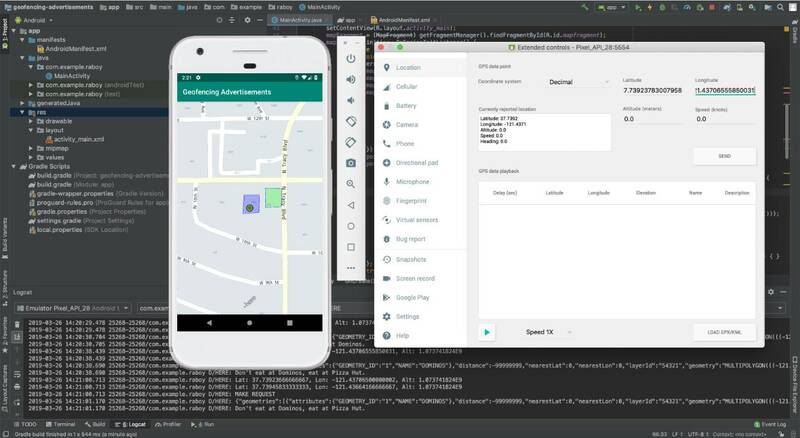 If you’ve never used a HERE map before in your Android project, I recommend you take a look at a tutorial I wrote titled, Getting Started with HERE Maps in an Android Application. We won’t be going through the configuration steps for this particular tutorial. In the above code we are initializing our map component, centering it on some coordinates, and drawing two polygons on the map. If you look at the coordinates used in each of the List<GeoCoordinate> variables, they should look very familiar to what we had put in our WKT file before uploading it to the HERE servers. Essentially we’re just drawing each of the two geofences to the map. Remember, to use a geofence, it is not a requirement to draw one, it only helps us out for visual reasons. You might remember that I wrote a previous tutorial titled, Gathering the Android Device Position with the HERE Positioning API, where we listened for changes in the position. We’re going to carry those concepts into this tutorial so we can check for how close our changed location is to a geofence. The most meaningful part of code for us resides in the onPositionUpdated method. This is where we’ll take the updated position and send it to the HERE server to see our proximity to a geofence. A few things to note though. The user will have to accept GPS permissions at runtime for the application, otherwise the location can not be determined. The AndroidManifest.xml file needs to have updated permissions for location. You can learn about both of these in my previous tutorial on positioning with Android. As of now we’ve created and uploaded our geofence and configured our Android application to listen for changes in position. The real magic is checking to see if our position is within a geofence that we’ve uploaded. To do this, we’ll need to make use of HTTP requests within Android. When the position changes, we’ll need to send that position to the HERE server along with the layer_id for our possible geofences. If there is a match, we’ll see such in the result and be able to do a push notification or similar to the user. There are numerous ways to do HTTP requests in Android, but the easiest is with Volley. You will need to install Volley with Gradle before you can use it, but if you need help, you can learn more about it in a previous tutorial I wrote titled, Using Volley to Make Android HTTP Requests. Alright so what is happening in this makeRequest method? We’re going to be making a GET request and expect a response in JSON format. The HTTP request is defined in the HERE Geofencing API documentation, but we’re taking our layer_id and current coordinates to check our proximity. We’re also asking for a NAME attribute because we uploaded name information in our WKT file. If we get a successful response, we’ll parse the data and see if any geometries were returned. If a geometry was returned it means we are likely within a geofence. If we’re in a geofence we should respond as such. In this example we are only printing to the logs, but a push notification or alert dialog could work too. Notice that we are calling the makeRequest method every time the position changes. In a production scenario, you may want to make sure the position changes based on a particular threshold so you’re not making non-stop requests and draining the battery. You just saw how to do geofencing with HERE and Android. This example was modeled after the McDonalds and Burger King shennanigans that happened a few months ago, but you can easily take this much further. For example you could expand until this demo and have the location and geofence checking happen in the background. Location intelligence is becoming more of a thing with brands trying to leverage everything in terms of location data to drive sales. For example, check out McDonalds latest acquisition of Dynamic Yield.